Over the last 5 or so years, how many new all purpose cleaners or degreasers have been released? It is just about impossible to count all of them. We now have so many options for quality cleaning products and new products are constantly being released. Yet, I find myself ordering a 5L of P21S Total Auto Wash whenever I run out. There are cheaper options available for a gallon of APC/degreaser, but p21s fits the bill for my clients and myself. First, I will take a moment to critique one aspect that I wish p21s had addressed many years ago. The 1000ml bottle that includes the sprayer has one flaw. I do not like the sprayer. I have nothing more to add except that for some reasons it seems to either leak or not spray well. Sometimes it acts up when they are brand new and then sometimes they have lasted a bit longer before giving up. Maybe others have had better fortune with them. This doesn’t impact me anymore as for the last few years our shop keeps a 5L bottle on tap and we don’t require the original sprayers. If you’re washing or detailing your car and you have a minimalist approach, p21s TAW will fit right into your workflow. Is it the most aggressive cleaner? Absolutely not! But it does offer nice cut for what people typical encounter; bug marks, bird droppings and lightly bonded contaminants. If you’re looking for an aggressive cleaner, look elsewhere. Despite its relatively easy-going attitude, what a lot of people don’t know is that it can be diluted. For instance, when I am looking to give a car a light decontamination prior to hand washing or detailing, I may spritz part or the whole body with a 10:1 solution of p21s TAW. By keeping a few bottles prepared with a selection of dilution ratios, you can be prepared for almost any car wash or detail. Another reason I love p21s Total Auto Wash is due to its pH(value), or potential of hydrogen. In regards to what matters in context of car people, pH uses a scale of 0-14 to represent the acidity or basicity of a cleaning chemical. Why is the pH of a product valuable to car guys? Instead of pretending I am a chemist, I will offer the same information that I learned years ago to you. “The pH scale measures how acidic or basic a substance is. It ranges from 0 to 14. A pH of 7 is neutral. A pH less than 7 is acidic, and a pH greater than 7 is basic. Each whole pH value below 7 is ten times more acidic than the next higher value. For example, a pH of 4 is ten times more acidic than a pH of 5 and 100 times (10 times 10) more acidic than a pH of 6. The same holds true for pH values above 7, each of which is ten times more alkaline—another way to say basic—than the next lower whole value. For example, a pH of 10 is ten times more alkaline than a pH of 9. Basically (no pun intended), if a chemical is either too strong of an acid or base, it can cause damage. Let’s relate it to real world chemicals many of us have used. Meguiar’s D101 All Purpose Cleaner has a pH of 12.3. That would make this cleaner a strong base, or a reactive base. As a reference, bleach has a pH of 13. A pH of 12.3 can literally cause damage to skin and or automotive surfaces. Some interior coatings will actually break down with the use of strong alkalines/bases. Meguiar’s Wheel Brightener has a pH as strong as 4.5. This too would be considered reactive. Have you ever used too strong of a Wheel Brightener solution on bare metal? You could see how the surface wasn’t happy, right? There’s a good reason Meguiar’s advises that you not mix it stronger than 4:1, use it on polisher or anodized wheels or leave it on even clear coated wheels for more than 45 seconds. It will cause damage! Pure water has a pH of 7 and it is completely neutral. 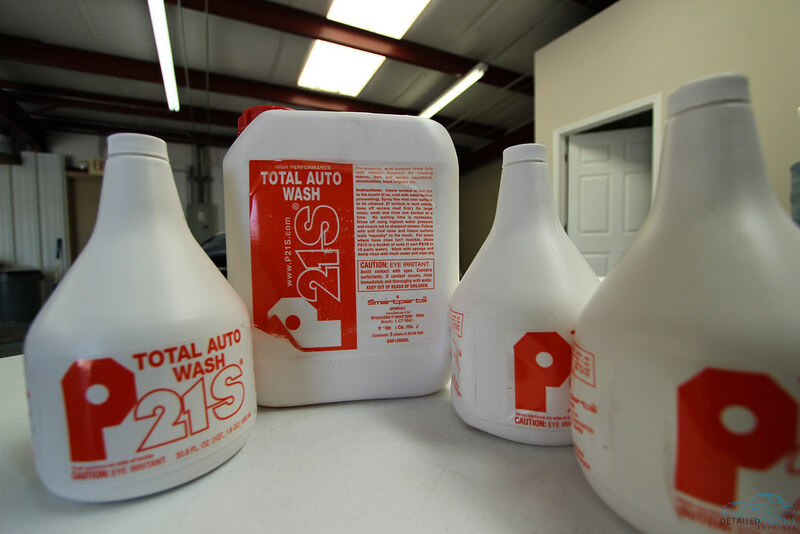 P21S Total Auto Wash has a pH of 9.6 according to a company representative. If you cut the p21s TAW the pH will further drop. Engine bays between 1:4 to non-diluted. Tires and wheel wells between 1:2 to non-diluted. Paint pre-treat between 1:10 to non-diluted. Door jambs and stops between 1:10 to non-diluted. Exterior vinyl decontamination with a non-diluted treatment. Paying attention to the real needs of the surface you’re cleaning will give you the insight needed to set the dilution ratio to one that gets the job done without being more aggressive or wasteful than needed. Time and experience with p21s TAW will give you valuable knowledge. So play with the dilution ratios and explore with the ways it can be used. Don’t be scared to play around with the product to see how it best fits your workflow. When foaming paint as a pre-wash treatment, you can add p21s TAW at about 1:20 to your shampoo of choice to add a cut booster. Be mindful that p21s TAW may be a little more prone to filming if left on too long during a foam treatment. Being quick to rinse away the foam will keep filming to a minimum. TAW provides amazing results on tires, wheels, engine bays and painted and vinyl exterior surfaces and it does it while providing a fine safety cushion. As a part of my arsenal, it fits perfectly. With all of the harsher all-purpose available, it’s good to know that p21s TAW is available. For all of the car detailing challenges we encounter in Atlanta, we need variety of pre-treats and degreasers at Detailed Designs Auto Spa and p21s TAW fits a large variety of needs we have. If you’ve not had a go with p21s Total Auto Wash yet, I advise you snag up a bottle and give it a go. I think you’ll find that when you run out, you’ll be visiting DI for another bottle as I do. p21s TAW really is a fantastic product. The day I find something better I will buy a lottery ticket. According to the internet, P21S TAW is the “same thing” as S100 Total Cycle Cleaner. I’d like to get a confirmation (or rejection) from P21 on this so that the same advice and science used in your review can extend to S100. Regardless, I will add that S100 (and likely P21) requires a rinse and shouldn’t be used like as a waterless wash or detailer. Neither your review or P21 advise this, but the labeling and the liquid consistency of the product (it’s not a shampoo) might make some people think it’s a spray-on wipe-off, which it isn’t. Think “APC”. Excellent point Richard. If we use p21s TAW to spot treat an area, we follow up with a thorough flushing. I can’t speak as to if TAW is the same formula as s100 TCC. I will request Greg follow up with p21s about the matter. Ill be honest, after talking to you about the use of TAW on clear bra, I bought a bottle and used it the day after I got it on a really nasty track car. So much track marble all over it…it all wiped off with ease after spraying it down with TAW. Thanks JC. I was always on the fence for that product! Awesome to hear Eric. Glad I could help. For engine bays, what do you use to actually remove the dirt and grime from surfaces? This product may do well and all loosening the contaminants, but is there any “follow up” work you would suggest before rinsing and dressing? You can use microfiber towels and/or brushes to agitate the surfaces. Follow up with flushing the slurry with water. Another option is to incorporate steam. We are big fans of using our VX5000 for engine bay cleaning and then we will use an airbrush to apply a quality rubber and vinyl conditioner. What dilution ratio should I use if I don’t want it to strip the wax?